Enrollment: For fall 2017, undergraduate enrollment was 6,314; 68% male, 32% female. Class of 2019: 12% were Rensselaer Medalists; 72% were in the top 10% of their class; average high school GPA was 3.77. Financial Aid: More than 90% of students receive aid, totaling $179 million annually. Rensselaer Polytechnic Institute (RPI) is a laboratory of innovation and technology where scientists, artists, engineers, architects, and business students learn and work together to create a collaborative learning environment unlike any other. Founded nearly two centuries ago, Rensselaer was the first technological research university founded in America, yet it is one of its most modern in terms of technology and innovation. It’s composed of five schools: Engineering; Science; Architecture; Humanities, Arts, and Social Sciences; and the Lally School of Management. Each has its own distinct characteristics and traditions, but through cross-discipline courses and programs, they work as one to ensure that students receive a well-rounded education. Its students come from near and far to learn. Among the current freshman class, 49 states and 62 countries are represented. While here, they’re part of a rigorous learning environment that’s devoted to educational innovation in the laboratory, classroom, and studio. 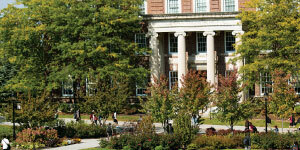 At Rensselaer, students receive a comprehensive education where they’re exposed to a wide array of topics and people. Central in this is CLASS, or Clustered Learning, Advocacy, and Support for Students. This initiative involves the entire RPI community working together to engage students in multiple facets of the educational experience at Rensselaer. Through time-based clustering, residential commons, interdisciplinary programs, and a support network of peers, staff, and faculty, students develop the intellectual agility, multicultural sophistication, and global awareness that will enable them to change the world. Students at Rensselaer also have the opportunity to lead or assist with projects that have lasting and far-reaching effects. They’re tackling such societal challenges as clean water, safe food, climate change, renewable energy, and disease control. They’re also building bridges, planning cities, and exploring the deepest reaches of outer space. In short: they’re changing the world. At Rensselaer, students learn by doing. Engineering undergraduates, for instance, work alongside acclaimed faculty on fuel cell research, earthquake engineering, and electricity transmission. Other students perform environmental research at the Darrin Fresh Water Institute or take part in the annual GameFest, where they can showcase the computer games they’ve designed in front of industry professionals, gaining valuable insight into the profession. Location is another benefit RPI students enjoy, as the school is a short drive from the tech hubs of Boston and New York City. Rensselaer’s Center for Career and Professional Development can help students strengthen their résumés by arranging internships and co-ops in not only these two cities but also at corporations, labs, and start-ups around the world. Amazon, Google, IBM, and NASA are just some of the places where Rensselaer students learn on the job. Rensselaer is at the center of some of the most groundbreaking research taking place today. It’s home to 33 research centers across five schools, with annual funding awards topping $110 million. Its primary research areas include biotechnology and the life sciences; energy and the environment; computational science and engineering; nanotechnology and advanced materials; and media, arts, science, and technology. Starting their freshman year, students have the opportunity to don lab coats and take part in research. Each year, more than 700 students participate in Rensselaer’s Undergraduate Research Program, which allows them to work on projects that could conceivably culminate with presentations at conferences or publication in journals. From Street Dance club and Space Society meetings to kung fu class and rugby practice, days at Rensselaer are never dull. The school offers more than 200 student clubs and organizations as well as numerous intramural sports. Also adding to RPI’s vibrant atmosphere is the abundance of undergraduates who call campus home. More than 60% of students live in Rensselaer’s 21 residence halls. Some of the halls are themed to match interests such as Design and Arts Housing, Leadership House, Wellness House, and the Vasuda Living and Learning Community, which is focused on issues related to the Earth and its natural resources. Off campus, Rensselaer’s hometown of Troy packs a punch in terms of cultural, entertainment, and dining options. One Friday a month, the town hosts Troy Night Out, a popular night of museum and musical events. Other events include the Troy Pig-Out, Victorian Stroll, and Chowderfest, when, as you guessed it, chowder tasting takes center stage. Another important aspect of student life at Rensselaer is studying abroad. The Rensselaer Education Across Cultural Horizons provides students with a variety of short- and long-term international study options in more than 15 countries on five continents. Some programs are professor led, while others are service opportunities or internships at overseas corporations. 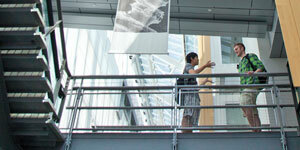 At Rensselaer, exposure to the world is not only encouraged but expected of all students. 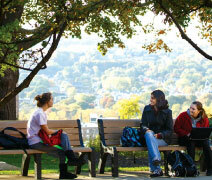 At Rensselaer, seeing is believing, which is why it’s suggested that prospective students visit the picturesque campus. Information sessions are held Monday through Saturday, during which admission counselors are available to answer questions and tours are led by current students, giving you the inside scoop on why Rensselaer is one of the world’s most innovative and forward-thinking universities.